Nine new gates may be just the beginning of a major expansion at O’Hare International Airport, already one of the busiest airports in the world. 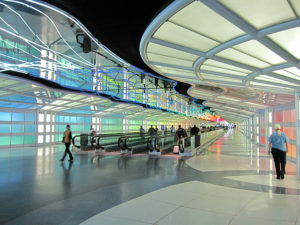 Mayor Rahm Emanuel announced that he has reached an agreement with several major airlines to build as many as nine new gates, while they continue to negotiate on the possibility of an even larger expansion which could make O’Hare a more convenient airport for passengers boarding and debarking from planes. The airport has been expanding little by little under the ongoing long-term plans for growth, but that growth has been realized mostly in new runways. A deal on additional gates has been alluding airport planners. Most of the push-back has come from the dominant airlines of United and American, which are worried about allowing for too much competition. It is unavoidable to add gates, however, if the airport wants to improve its on-time performance. The new runways being built will not help the airport significantly if there are not places for landed planes to park and let their passengers disembark. The result of this lack of gates is that O’Hare has some of the longest flight delays among US airports. With passengers avoiding Chicago, the city’s economy is adversely affected as well. The plan Emanuel announced involves as many as nine gates to the 25 which already exist at Terminal 5. It is expected to cost $300 million, to be paid for with existing passenger facility charges, the extra fee that is added to the cost of a plane ticket.